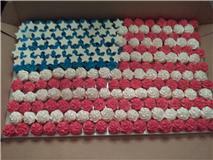 To celebrate Charlotte Hall Veterans Home Employee Banquet, I made an American Flag cupcake cake. 250 cupcakes made up the display. It took 6 hours to complete and my kitchen was a TOTAL mess by the end. The finished product turned out great and that's what matters!